Purpose: To evaluate the risk factors and treatment outcome of microbial keratitis in a tertiary eye care centre. Methods: A hospital based prospective study in clinically diagnosed cases with microbial keratitis were enrolled. Corneal scrapes taken and subjected to direct microscopy and culture. Empirical treatment initiated following smear report and definitive treatment commenced after culture and sensitivity report. Patients were followed up for 3 months. Treatment outcome was assessed on the basis of signs of healing, scar formation, necessity of surgical intervention and severe complications. Results: A total of 95 patients were included. Microbial keratitis was common in the age group of 51-60 years with male preponderance. It was common in people involved in agricultural works, and frequent during the agricultural season of monsoon and spring. Among the predisposing factors, history of ocular trauma with vegetative matter is common. Majority presented before 14 days of onset of symptoms and also had history of prior treatment. Organisms were identified under direct microscopy in (38.9%) of cases and isolated in (51.6%) in culture medium. Streptococcus pneumoniae (22.1%) and Aspergillus (7.3%) were the most common bacterial and fungal isolate respectively. In vitro antibiotic sensitivity demonstrated bacteria were most sensitive to ofloxacin. A total of (75.8%) patients achieved complete healing whereas (10.5%) required surgical intervention. Conclusion: Early presentation, medication compliance and timely intervention can lead to good clinical and visual outcome in patients with microbial keratitis. Keratitis represents corneal inflammation from various causes and clinical manifestations, whereas microbial keratitis is an infection that can be caused by a range of nonviral pathogens including bacteria, protists, and fungi. Corneal ulceration is defined as loss or discontinuity of the corneal epithelium, with underlying stromal infiltration and suppuration associated with signs of inflammation with or without hypopyon. The World Health Organization (WHO) recognizes corneal diseases as major cause of vision loss, second only to cataract, and an emerging cause of visual disability, occurring as “silent epidemic” of blindness worldwide. The WHO Southeast Asia Region commissioned study estimated six million corneal ulcers occurring annually in ten countries of Southeast Asia. These estimates are based on the data from countries where the incidence of corneal ulceration ranged from a low of 113/100,000 in India to as high as 799/100,000 in Nepal. In contrast, to the estimated incidence of two to 11/100,000 in the United States. Most cases of microbial keratitis follow minor ocular trauma during agricultural or domestic activities. The drift from agriculture to other professions over the course of time might have changed the scenario. Treatment of keratitis in our setup is still difficult for a variety of reasons; delayed presentation, inaccessibility of suitable medications, and lack of donor grafts. The result may vary from corneal scarring to corneal perforation with endophthalmitis, panophthalmitis, and loss of eye at the worst. The poor visual outcome even after successful treatment makes the management of microbial keratitis truly a challenge. Hence, this study was undertaken to ascertain the demographic pattern, predisposing risk factors, treatment as well as clinical outcome of microbial keratitis attending tertiary eye care center. This hospital-based prospective, observational study was accomplished over a period of 12 months from January to December 2015 in a tertiary referral center in Kathmandu. A total of 150 cases of keratitis were screened. The inclusion criteria were all the diagnosed cases of microbial keratitis who underwent detailed ophthalmological evaluation. The following groups were excluded; typical or suspected viral keratitis, Mooren's ulcer, neurotrophic ulcer, interstitial keratitis, ulcers associated with autoimmune diseases, recurrent microbial keratitis on the donor cornea following penetrating keratoplasty (PK), and patients unwilling to participate. Informed consent was obtained and clinical examinations were carried out in all the cases and documented in structured pro forma. Inquiry was done regarding the history of onset of symptoms; pain, redness, photophobia, watering, discharge as well as predisposing corneal trauma, contact lens wear, and ocular surgery. Systemic disease, occupational history, and any form of prior treatment were recorded. General physical examination carried out to rule out anemia, malnutrition, or other evidence of systemic illness. Visual acuity (VA) was documented as per the WHO International Statistical Classification of Diseases and Related Health Problems 10th Revision. Gross external ocular examination of the eyelids and lacrimal sac was performed. Syringing was done in all the patients and corneal sensation assessed when possible. Anterior segment evaluation was effected using the Haag–Streit slit-lamp biomicroscope with appropriate magnification and illumination. Detailed examination of the conjunctiva and cornea performed including the ulcer. Recordings were made with respect to the location, size, and depth of the ulcer; dimensions of the epithelial defect; and stromal infiltrate. Apart from this, scleral involvement if any was recorded. The location of the ulcer inscribed as central, paracentral, or peripheral and also the shape, margins, and the size of the ulcer documented. Size of the defect was measured after staining with 2% fluorescein. First, the longest dimension of the defect followed by dimension perpendicular to the first was measured, in a similar fashion, the size and depth of the stromal infiltrate recorded. Stromal infiltrate was observed for its color, depth, and margin along with surrounding corneal haze. The ulcer depth was evaluated as <20%, 20%–50%, or >50% of the total corneal thickness. Corneal vascularization was noted as superficial or deep. Details of each ulcer illustrated on a standardized form using frontal and cross-sectional diagrams. The anterior chamber reaction was graded according to Hogan's classification. Hypopyon was looked over and the height measured in millimeters if present. The iris, pupils, lens, and fundus evaluation were done in the cases whenever possible. Ultrasound A and B scan were performed if posterior segment could not be visualized to negate the presence of vitritis and/or endophthalmitis. Intraocular pressure was measured digitally or with air-puff tonometer when possible. Random blood sugar test was done in all the cases as well as relevant systemic investigations when necessary. Corneal scraping performed under magnification of a slit-lamp biomicroscope or Zeiss operating microscope after anesthetizing the affected eye with topical 0.5% proparacaine hydrochloride. Surgical Bard–Parker blade no. 15 was used to scrape over the surface of the suppurative area in a series of short, moderate firm strokes to sample both the leading edges and the base of each infiltrated area in one direction from peripheral margins toward the center. The material obtained initially smeared onto labeled sterile glass slides for 10% potassium hydroxide (KOH) wet mount and Gram stain. The next specimen inoculated directly onto the surface of solid media; blood agar, chocolate agar, and Sabouraud dextrose agar (SDA) in rows of C streaks and also inoculated into the depth of liquid medium, particularly brain–heart infusion broth. The slide specimens were viewed with ×10 and ×100 oil-immersion objective of a Nikon microscope. All inoculated media were incubated aerobically where SDA was incubated at 27°C, examined daily, and discarded at 3 weeks if no growth was seen. The inoculated blood agar, chocolate agar, and brain–heart infusion broth were incubated at 37°C, examined daily, and discarded at 7 days when no growth seen. Microbial cultures were considered relevant if growth of the same organism on more than one solid-phase medium, confluent growth at the site of inoculation on one solid medium, growth of one medium consistent with direct microscopy findings, or growth of same organism from repeated scraping. For the entire bacterial isolates, antimicrobial sensitivity test was performed by Kirby–Bauer disc diffusion method. Processing, reading of the results and zone size interpretation was performed as per the NCCLS (Clinical and Laboratory Standards Institute) guidelines. Initial therapy in the form of antibacterial or antifungal was decided on the basis of smear report or on the basis of patient's history and clinical examination when smear negative. Treatment switched to suitable antibiotic or antifungal after the availability of culture sensitivity report if needed. Adjunctive therapy including atropine 1% eye drop, antiglaucoma therapy started when needed. In severe ulcers not responding to empirical therapy, treatment was modified in the form of systemic antibacterial or antifungal therapy. For impending or perforated ulcer, bandage contact lens or therapeutic PK was done. Clinical response was evaluated in the form of VA, healing of ulcer, and complications if encountered at each follow-up visits. Cases were followed up to 3 months. The ethical approval for this study was obtained from the Institutional Review Board Research and Ethics Committee at Institute of Medicine, Tribhuvan University. The collected data were analyzed in SPSS version 20. (IBM, NY, USA) Descriptive statistics: Mean, median, standard deviation, percentage, and frequency were calculated to describe the various sociodemographic variables. Vision documented in Snellen's chart values were converted to logMAR equivalent for analysis. Inferential statistics: Independent sample t-test and paired t-test were used for the analysis of categorical data. P value was calculated at 95% confidence interval. During the study period, a total of 95 eyes of 95 patients were included in this study. The mean age of the patients was 45 ± 20.44 years ranging from 1 to 92 years. Fifty-one (53.7%) were male and 44 (46.3%) female with m: f ratio of 1.2:1 [Figure 1]. Frequency of patients was high during the monsoon season of June and July followed by winter season in January. Maximum number of 45 (47.3%) patients presented between April and July [Figure 2]. Agriculture workers and homemakers were the most common group comprising of 49 (51.6%) patients in this study. The median duration of the presentation was 7 days ranging from 1 to 75 days after onset of symptoms or injury. Thirty (31.6%) patients presented between 4 and 7 days of onset of symptoms. Majority of patients (80%) presented within 2 weeks of onset of symptoms. Majority (53.7%) of the corneal ulcer was present in the right eye of the patient [Table 1]. Majority of the patients (85.2%) had no any systemic association. Four (4.2%) patients had diabetes mellitus and hypertension, respectively. Half of the patients (52.6%) had previous history of treatment before the presentation at our center. More than half of the corneal ulcers are located in the paracentral region 53 (55.8%) followed by 26 (27.4%) central and peripheral 16 (16.8%) in our study. Regarding the size, 58 (61%) were <2 mm at the time of presentation followed by 34 (36%) ulcers with the size of 2–5 mm and 3 (3%) comprising >5-mm ulcer. On direct microscopy after Gram's stain, bacteria was seen in 30 (31.6%) cases, out of which 28 (29.5%) cases were Gram positive and 2 (2.1%) cases were Gram negative. Fungal filaments were seen in 7 (7.4%) cases in 10% KOH mount. Culture was positive in 49 (51.6%) cases but none had mixed bacterial and fungal growth [Table 2]. Out of 37 bacterial isolates, 36 cases appeared as single bacterial growth and 1 case had mixed growth of two bacteria. The most common isolate was Streptococcus pneumoniae in 21 (22.1%) cases, followed by Staphylococcus aureus in 14 (14.7%) cases. Gram-negative bacterial isolate was Pseudomonas aeruginosa in 1 (1.1%) case as a single growth and in 1 (1.1%) case mixed with Staphylococcus. Among fungi, Aspergillus was the most common isolate seen in 7 (7.3%) cases. Other fungi isolated were Fusarium in 3 (3.1%) cases, Penicillium in 1 (1.1%) case, and Curvularia in 1(1.1%) case [Table 3]. Out of 95 patients who were followed up for 3 months, 72 (75.8%) patients achieved good outcome in the form of complete healing of corneal ulcer. Among them, 56 (59%) patients had minimal corneal scarring, whereas 16 (16.8%) patients had dense leukomatous opacity during the healing process. Poor outcome was seen in 23 (24.2%) patients. Among them, low vision was due to age-related cataract in 4 (4.2%) patients, 1 (1.1%) patient initially presented with NPL vision. Ulcer in 8 (8.4%) patients was nonhealing, out of which four patients lost follow-up after 3 months. Evisceration was done in 1 (1.1%) patient due to uveal tissue prolapse with extrusion of intraocular material and PK was done in 9 (9.4%) patients. Among the cases of PK, therapeutic PK was done in two patients, whereas seven patients underwent PK for tectonic as well as therapeutic purpose. The cases that underwent PK were followed up to 3 months from the date of surgery. Out of nine patients who underwent PK, fungi were isolated in four patients where Aspergillus species was encountered in three followed by Fusarium species in one case, Gram-positive S. pneumoniae in three cases, and Gram-negative P. aeruginosa in remaining two cases, respectively. The various risk factors contributing to microbial keratitis with the final outcome in terms of vision attained at the last follow-up was also determined. Out of 95 patients included in the study, two patients were not included in the analysis of final VA as the documented vision was NPL [Table 4]. There was a difference in final visual outcome among the cases presenting before or after 7 days. The cases presenting earlier had better visual recovery (P = 0.001). There was a difference in the final visual outcome between the cases with and without trauma but with no statistical significance (P = 0.622). The relationship of final visual outcome between the cases with and without systemic diseases was not significant (P = 0.149). 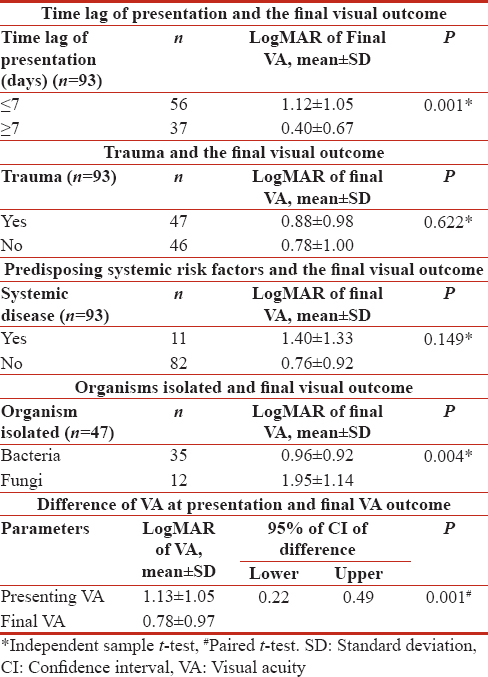 Comparing the final VA and organism isolated in culture, final VA was poorer in cases with fungal corneal ulcer than cases with bacterial corneal ulcers (P = 0.004). The two cases which were not evaluated had a growth of S. aureus and S. pneumoniae, respectively. There was a significant difference between the VA at presentation and final VA after treatment (P = 0.001) [Table 5]. Microbial keratitis is a potentially blinding condition. The etiological and epidemiological pattern varies from country to country, region to region within the same country, and over the time in the same region. Therapeutic challenges and poor outcomes make it difficult to treat. A total of 95 patients with microbial keratitis who met all the inclusion criteria of the study protocol were enrolled. Maximum number of 57 (60%) patients belonged to the age group of 21–60 years, which is the most productive socioeconomic population of Nepal. Presentation in this age group was more common because persons belonging to this age group are more active and involve themselves in outdoor activities. The affection of the keratitis in males was found in other similar studies in Eastern Nepal (59%) as well as Western Nepal (57.2%), respectively. Males were affected more compared to females, because they are mostly engaged as agricultural workforce as well as other outdoor and recreational activities and their propensity for risk-taking behavior. Although corneal ulcers may occur throughout the year, increased frequency during spring and monsoon season between April and July were noticed. This portrays the frequency of ulcers when agricultural activity increases, especially during crop plantation season in Nepal. Encounters of corneal ulcer among agricultural workers were identical to other studies.,, The median duration of the presentation was 7 days where (58.9%) of patients presented to the hospital before 7 days of onset of symptoms, similar to the study from South India, however, delayed presentation of 2–3 weeks was reported by Basak et al. The findings can be correlated with the regional distribution, where majority of the patients are from Hilly regions which are present in and around Kathmandu valley, where the hospital is located. Transport facilities and access to health-care systems are important issues with this regard to the early presentation in our setup. Corneal trauma has always been identified as a major risk factors for microbial keratitis., Whereas, contact lens use was pointed out by Ibrahim et al. and Green et al. While contact lens use is a major risk factor for ulcerations in the developed world, it is expected that in an agrarian society like Nepal, vegetative matter would be the predominant injuring agent. Bourcier et al. also stated no significant correlation between systemic risk factors and severity of clinical presentation. Majority of the patients had no systemic diseases and the association also could not be established. The outcome of keratitis associated with the predisposing systemic conditions were only presumptive. The tendency to prescribe a cocktail of drugs in insufficient dosage demonstrating the tendency of medical practitioners to treat the condition inadequately before referral points out to the situation that half of the patients in our study also had prior treatment history. Gopinathan et al. found (54.6%) receiving topical treatment elsewhere, whereas Lavaju et al. stated prior steroid administration of (4.5%). Over-the-counter medications from a local chemist, appraise lack of awareness of the disease and its complications. The microbiological findings were comparable to the previous study in Nepal by Feilmeier et al. with (34.6%) positive smear microscopy and (40%) culture positivity, but Srinivasan et al. reported higher positive culture of (68.4%). The lower rate of isolation in our study could be attributed to prior empirical topical antibiotics,, small amount of scraped specimen, and inability to employ selective media for isolation of the organisms. Frequency of bacterial isolates was higher than fungal isolates. The proportion of ulcers caused by filamentous fungi increases toward warmer climates or tropical latitudes which is different from the location of our hospital which has temperate climate, and it has been reported that fungal ulcers are relatively uncommon in temperate climates. Similarly, S. pneumoniae is considered to be more common in developing nations. Ofloxacin monotherapy has been recommended as it is associated with less toxicity. Similarly, the efficacy of ofloxacin solution in treating bacterial keratitis is equivalent to that of the fortified cefazolin and tobramycin solutions. However, resistance to ofloxacin is emerging where there was a three-fold increase in the percentage of resistant S. aureus isolates to fluoroquinolones between 1990 and 1994 and between 1995 and 1998. Both fluoroquinolones and aminoglycosides exhibited low in vitro effectiveness against P. aeruginosa. The emerging resistance of organism toward antibiotic is a growing concern worldwide. There was not much difference between the numbers of patients and size of ulcer as many of our patients came to us in the early stages of the disease. Positivity of direct microscopic examination was higher among eyes with larger ulcers >2 mm. It was highlighted that ulcer size is an important risk factor and also patients with large ulcers were more likely to be culture positive, fail primary therapy, and require surgical intervention. Paracentral location of ulcer also might have helped in the better outcome as vision is likely found to be more compromised with the location as the ulcer around the optical axis of the eye or the pupillary area (approximately 4 mm) are more compromising than peripheral. Similar to our study, more number of patients required surgical treatment in fungal keratitis (50.8%) compared to bacterial (43.2%) and Acanthamoeba keratitis (17.4%). Fungal keratitis was more prone to perforation than bacterial and is frequently considered more difficult to treat than bacterial keratitis. Fungal keratitis treated with 5% natamycin monotherapy, larger ulcer size and infection with Aspergillus were predictors of a poor outcome. The poor outcome was not only related to risk factors regarding time of presentation, prior inadequate treatment, size of ulcer, or etiological organism but there was also the presence of confounding variable of age in four patients where age-related cataract also played a role in the final visual outcome. 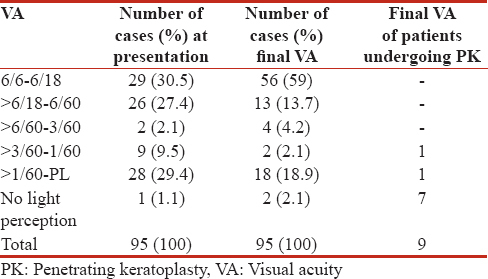 Successful medical treatment of microbial keratitis was evidenced in various other studies.,,, and early presentation accounts for good visual outcome.,, Comparing the final VA and organism isolated, final VA was poorer in cases with fungal ulcers than bacterial. Fungal keratitis is frequently considered more difficult to treat than bacterial keratitis and is thought to have worse prognosis. The fungal keratitis is also more likely to perforate and require PK which is the reason for the poor outcome. Although challenging, the treatment outcome of microbial keratitis was good provided early presentation and timely intervention. Similarly, treatment of fungal keratitis was difficult because of unavailability of broad spectrum of antifungal drugs and absence of antifungal drug sensitivity. Accurate diagnosis, compliance with medications, use of protective eyewear at work and timely intervention can lead to good clinical and visual outcome in patients with microbial keratitis. Prior treatment before presentation might have led to negative cultures. Whitcher JP, Srinivasan M, Upadhyay MP. Corneal blindness: A global perspective. Bull World Health Organ 2001;79:214-21. Resnikoff S, Pascolini D, Etya'ale D, Kocur I, Pararajasegaram R, Pokharel GP, et al. Global data on visual impairment in the year 2002. Bull World Health Organ 2004;82:844-51. Whitcher J, Srinivasan M. Corneal ulceration in the developing world – A silent epidemic. Br J Ophthalmol 1997;81:622-3. World Health Organization. Guidelines for the Management of Corneal Ulcer at Primary, Secondary and Tertiary Care Health Facilities in the South-East Asia Region: WHO Regional Office for South-East Asia; 2004. Upadhyay MP, Karmacharya PC, Koirala S, Shah DN, Shakya S, Shrestha JK, et al. The bhaktapur eye study: Ocular trauma and antibiotic prophylaxis for the prevention of corneal ulceration in Nepal. Br J Ophthalmol 2001;85:388-92. Erie JC, Nevitt MP, Hodge DO, Ballard DJ. Incidence of ulcerative keratitis in a defined population from 1950 through 1988. Arch Ophthalmol 1993;111:1665-71.
International Statistical Classification of Diseases and Related Health Problems 10th Revision (ICD-10) Chapter VII: Diseases of the Eye and Adnexa (H00-H59) World Health Organization; 2016. Available from: http://www.apps.who.int/classifications/icd10/browse/2016/en#/H53-H54. [Last accessed on 2018 May 12]. Harrison SM. Grading corneal ulcers. Ann Ophthalmol 1975;7:537-9, 541-2. Hogan MJ, Kimura SJ, Thygeson P. Signs and symptoms of uveitis. I. Anterior uveitis. Am J Ophthalmol 1959;47:155-70. Gupta N, Tandon R. Investigative modalities in infectious keratitis. Indian J Ophthalmol 2008;56:209-13. Wikler MA. Performance Standards for Antimicrobial Susceptibility Testing: Sixteenth Informational Supplement. Wayne, Pennsylvania, USA. Clinical and Laboratory Standards Institute; 2006. Population Atlas Nepal: Nepal Government Central Bureau of Statistics; 2014. Available from: http://www.cbs.gov.np/sectoral_statistics/population. [Last accessed on 2018 May 12]. Lavaju P, Arya SK, Khanal B, Amatya R, Patel S. Demograhic pattern, clinical features and treatment outcome of patients with infective keratitis in the eastern region of Nepal. Nepal J Ophthalmol 2009;1:101-6. Dhakhwa K, Sharma MK, Bajimaya S, Dwivedi AK, Rai S. Causative organisms in microbial keratitis, their sensitivity pattern and treatment outcome in Western Nepal. Nepal J Ophthalmol 2012;4:119-27. Norina TJ, Raihan S, Bakiah S, Ezanee M, Liza-Sharmini AT, Wan Hazzabah WH, et al. Microbial keratitis: Aetiological diagnosis and clinical features in patients admitted to Hospital Universiti Sains Malaysia. Singapore Med J 2008;49:67-71. Gopinathan U, Sharma S, Garg P, Rao GN. 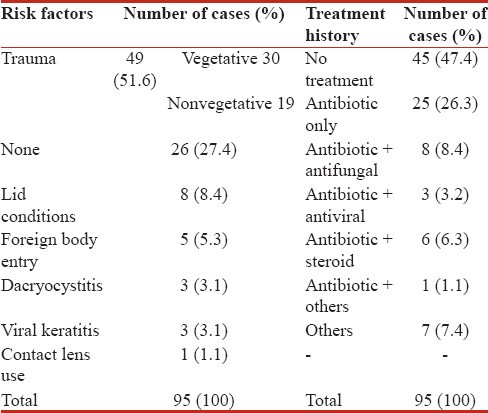 Review of epidemiological features, microbiological diagnosis and treatment outcome of microbial keratitis: Experience of over a decade. Indian J Ophthalmol 2009;57:273-9. Ibrahim YW, Boase DL, Cree IA. Epidemiological characteristics, predisposing factors and microbiological profiles of infectious corneal ulcers: The portsmouth corneal ulcer study. Br J Ophthalmol 2009;93:1319-24. Green M, Apel A, Stapleton F. Risk factors and causative organisms in microbial keratitis. Cornea 2008;27:22-7. Bourcier T, Thomas F, Borderie V, Chaumeil C, Laroche L. Bacterial keratitis: Predisposing factors, clinical and microbiological review of 300 cases. Br J Ophthalmol 2003;87:834-8. Feilmeier MR, Sivaraman KR, Oliva M, Tabin GC, Gurung R. Etiologic diagnosis of corneal ulceration at a tertiary eye center in Kathmandu, Nepal. Cornea 2010;29:1380-5. Hagan M, Wright E, Newman M, Dolin P, Johnson G. Causes of suppurative keratitis in Ghana. Br J Ophthalmol 1995;79:1024-8. Leck AK, Thomas PA, Hagan M, Kaliamurthy J, Ackuaku E, John M, et al. Aetiology of suppurative corneal ulcers in Ghana and South India, and epidemiology of fungal keratitis. Br J Ophthalmol 2002;86:1211-5. Thapa M, Sharma AK, Shah DN, Kc S, Shrestha S. Organism isolation in corneal ulcer: Utility of different techniques. JNMA J Nepal Med Assoc 2012;52:14-9. Ofloxacin monotherapy for the primary treatment of microbial keratitis: A double-masked, randomized, controlled trial with conventional dual therapy. The ofloxacin study group. Ophthalmology 1997;104:1902-9. O'Brien TP, Maguire MG, Fink NE, Alfonso E, McDonnell P. Efficacy of ofloxacin vs. cefazolin and tobramycin in the therapy for bacterial keratitis. Report from the bacterial keratitis study research group. Arch Ophthalmol 1995;113:1257-65. Alexandrakis G, Alfonso EC, Miller D. Shifting trends in bacterial keratitis in South Florida and emerging resistance to fluoroquinolones. Ophthalmology 2000;107:1497-502. Bharathi MJ, Ramakrishnan R, Meenakshi R, Mittal S, Shivakumar C, Srinivasan M, et al. Microbiological diagnosis of infective keratitis: Comparative evaluation of direct microscopy and culture results. Br J Ophthalmol 2006;90:1271-6. Blanton CL, Rapuano CJ, Cohen EJ, Laibson PR. Initial treatment of microbial keratitis. Eye Contact Lens 1996;22:136-40. Morlet N, Minassian D, Butcher J. Risk factors for treatment outcome of suspected microbial keratitis. Ofloxacin study group. Br J Ophthalmol 1999;83:1027-31. Prajna NV, Srinivasan M, Lalitha P, Krishnan T, Rajaraman R, Ravindran M, et al. Differences in clinical outcomes in keratitis due to fungus and bacteria. JAMA Ophthalmol 2013;131:1088-9. Lalitha P, Prajna NV, Kabra A, Mahadevan K, Srinivasan M. Risk factors for treatment outcome in fungal keratitis. Ophthalmology 2006;113:526-30. Saeed A, D'Arcy F, Stack J, Collum LM, Power W, Beatty S, et al. Risk factors, microbiological findings, and clinical outcomes in cases of microbial keratitis admitted to a tertiary referral center in Ireland. Cornea 2009;28:285-92. Fong CF, Tseng CH, Hu FR, Wang IJ, Chen WL, Hou YC, et al. Clinical characteristics of microbial keratitis in a university hospital in Taiwan. Am J Ophthalmol 2004;137:329-36. Wong TY, Ng TP, Fong KS, Tan DT. Risk factors and clinical outcomes between fungal and bacterial keratitis: A comparative study. CLAO J 1997;23:275-81.